Jonah Westerman examines the history of the term ‘performance’ since the mid-twentieth century and considers how the category has come to encompass so many kinds of artistic production. He challenges notions of performance that seek to define it as a medium or genre and argues instead that performance is an interrelated set of questions concerning how art relates to its audiences and the wider social world. ‘Performance’ is a term at odds with itself. It is a singular heading under which a vast field of divergent artistic practices, each with distinct forms, aims and histories, have been ordered. The word is used as a descriptor in relation to almost all kinds of contemporary artistic production – often in the adjectival form ‘performative’1 – and yet the specific element to which the term refers evades definitive identification. Performance regresses infinitely as it burrows deeper into our language; it often seems that it is both everywhere and nowhere. The term ‘performance’ was conceived initially as a way to argue for the legitimacy of mid-twentieth century artworks that were intended to challenge entrenched notions about the autonomy of art and its proper media. Today, however, the discourse of performance has become a monolith. Moreover, this new orthodoxy is intrinsically riven. Designed from the outset as a catch-all term for the uncategorisable, the definition of performance as a medium has always seemed as urgent as it is impossible. The contemporary sense of performance’s quicksilver ubiquity stems from this paradoxical critical imperative. Yet this issue of ontology – what performance is – has come to obscure questions of historical function – what those same works do, how they do it, and why. This essay argues that, properly understood, performance is not (and never was) a medium, not something that an artwork can be but rather a set of questions and concerns about how art relates to people and the wider social world. What we need, then, are ways to reclaim these obscured histories and to specify with greater sensitivity and precision how these works mediate social relations between people. In 1952 American art historian and critic Harold Rosenberg embarked on a lexical reckoning with what he perceived to be a fundamental mutation occurring within the field of visual art. ‘Language’, he wrote, ‘has not accustomed itself to a situation in which the act itself is the “object”.’2 He was talking about a new approach to painting, typified by the works of artists like Jackson Pollock (fig.1). For Rosenberg, a Pollock painting was best understood not in terms of compositional quality or representational capacity but for how it registered the process of its own creation. According to him, ‘What was to go on the canvas was not a picture but an event’; he named this activity ‘Action Painting’.3 It was impossible for Rosenberg to divorce the look of the finished product from the process of its production. To say that the object was the act itself meant that the borders of the work opened – the artwork was no longer a thing unto itself but a time-bound artifact of human activity, a trace of an action. The painting persisted as an object but it would now always point back to the moment of its creation and away from itself toward the wider world. Or, as Rosenberg put it, ‘the new painting has broken down every distinction between art and life’.4 The world beyond the artwork’s traditional frame became part of its very constitution. Critical language would have to consider embodied processes of both creation and reception, as well as what effects these might have on how a work of art can and does make meaning. In opposition to major critical trends of the day that held that the subject of art was art itself, Rosenberg sought a way to express the connection between art and life, to describe the activity of art-making in its personal and practical dimensions. Kaprow continued, ‘Pollock, as I see him, left us at the point where we must become preoccupied with the space and objects of our everyday life, either our bodies, clothes, rooms, or, if need be, the vastness of 42nd Street.’7 Because how an artwork gestured out toward the world had become visible, everyday reality could now become the stuff of art. Placing ordinary objects and people within the explicit frame of art refocused attention on how people understand themselves and relate to each other. The destruction of painting’s edge announced that relationship between artist, spectator, and world as art’s new form and purpose. As Kaprow put it in 1961, ‘Happenings are events that, put simply, happen … nothing obvious is sought and therefore nothing is won, except the certainty of a number of occurrences of which we are more than normally attentive […] Happenings invite us to cast aside for a moment these proper manners and partake wholly in the real nature of the art and (one hopes) life.’8 For Kaprow, the literal expansion of art’s frame, a re-imagining of the boundaries of representation, could provide a direct conduit to a heightened experience of reality. Yet this only begins to intimate the depth and breadth of practical innovation taking place during the period. Kaprow’s first Happening, 18 Happenings in 6 Parts, took place in 1959. The Japanese collective Gutai was active even earlier, blending actions and objects in the pursuit of new artistic forms. Fluxus events toured internationally, reeling in and launching individual artists such as Joseph Beuys and Yoko Ono; and the Vienna Actionists in Austria put on elaborate, ritualistic spectacles. This is not to mention the Judson Dance Theater in USA, Tropicália in Brazil, The New Art Practice in Yugoslavia, Collective Actions in the Soviet Union and Body Art (from Carolee Schneemann to Vito Acconci to Marina Abramović to Hannah Wilke to Gina Pane, to cite only some of the more canonical examples). As these examples begin to illustrate, the issues raised (but by no means initiated) by Rosenberg’s analysis of action painting – art’s relation to everyday reality, to time, to process and to new modes of spectatorship – resonated widely through performance’s multiplying sites. By foregrounding contemporaneous critical concerns around language and the expansion of art beyond its traditional bounds, however, a peculiar fact comes into focus. While we have come to call all these things (and many more) ‘performance’, the term was not always used in this same way at the time. Performance was a word that circulated throughout the period – often meaning something like occasion, or an appointed time at which a happening, event or action would take place – but it only crystallised into a discursive formation with the authority of genre at the end of the 1970s. By then there were magazines and journals dedicated to this new form, with titles like High Performance (established in 1978) and Performance Magazine (established in 1979). The year 1979 also saw the publication of art historian RoseLee Goldberg’s field-defining book, Performance: Live Art, 1909 to the Present. Such publications served as crucial fora for discussion and networking and, as the title of Goldberg’s study makes plain, for attempts to develop historical narratives and understandings of just what was happening to art and what the changes signaled. This new discourse of performance acquired a centripetal force. Anything at odds with traditional art practice, especially if it eschewed medium-specificity and unfolded somehow through durational experience, became performance. The new understanding pulled together under one heading all those concerns about time, space, embodiment, viewer participation, social context and so on that placed artworks beyond the modernist pale. Or, as art historian Douglas Crimp put it in his seminal article, ‘Pictures’ (also published in 1979), ‘The mode that was thus to become exemplary during the seventies was performance – and not only that narrowly defined activity called performance art, but all those works that were constituted in a situation and for a duration by the artist or the spectator or both together’.9 Moreover, Crimp went on to argue that this ‘mode’ extended even beyond time-bound or time-based works to encompass image-based practices as well. 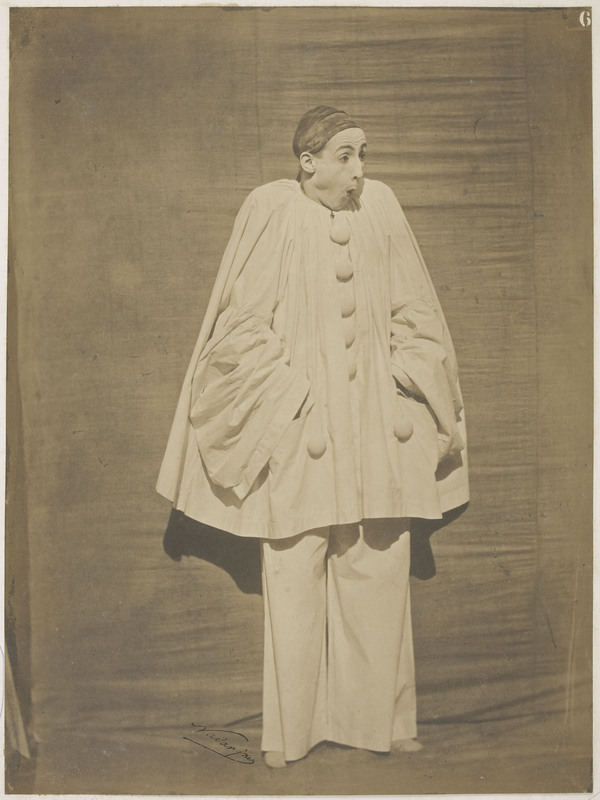 According to him, while artists like Jack Goldstein, Cindy Sherman and Robert Longo ‘can be said to have apprenticed in the field of performance […], they have nevertheless begun to reverse its priorities, making of the literal situation and the duration of the performed event a tableau whose presence and temporality are utterly psychologized; performance becomes just one of a number of ways of “staging” a picture.’10 Their pictures were performances, too, for the way they depended on the viewer’s ‘psychology’ to animate their allusive narratives and thus located the works’ meaning outside of the frame. That is, for Crimp, what made these works of performance was not merely the theatricality of the activities depicted but rather their expansion beyond the physical and temporal borders of their own making to include the subsequent interpretive work undertaken by viewers. As the term ‘performance’ was deployed more and more to describe new artworks, the discursive whirlwind gathered speed and volume, consuming works of earlier moments as well. Goldberg’s historical narrative had pulled both Italian and Russian futurisms, as well as dada within performance’s compass; these have now come to be regarded as historical precedents for our performative, ‘post-medium’ condition. And in 1998 a landmark exhibition at the Los Angeles Museum of Contemporary Art, Out of Actions: Between Performance and the Object, 1949–1979, organised by curator Paul Schimmel, sited performance at the centre of global postwar art. By the close of the twentieth century Jackson Pollock was neither an action painter nor an abstract expressionist but a performance artist. If performance is what we call something that exceeds categorical boundaries by involving time, space and their vicissitudes in the figure of human apperception, and all art is or can be described in this way, then all art is performance. It would seem that, sixty-odd years after Rosenberg’s initial attempts, language has indeed accustomed itself to a situation in which the act itself is the object. More accurately, language has become too comfortable, too accustomed to the coincidence of action and object, at the expense of precision and has lost the power to describe the many articulations of this relationship wrought by actual artworks. The problem with such a ubiquitous usage of ‘performance’ is that it can obscure, by way of generality, more than it illuminates. Each designation fails as description insofar as it conflates rather than parses, settling for the general instead of pursuing the specific. Performance has become hard to see because of its seeming omnipresence. If the category of performance was once a useful way to describe works that expanded the practice and meaning of art beyond the work itself to include its situation in the world, this utility has all but vanished given that such a broadened scope now characterises usual assumptions about art rather than being a value that must be defended or won. As a result, the designation’s too-easy deployment more often blinds us and short-circuits attempts to ascertain formally and conceptually how a given work functions. Attempting to take the measure of a work by considering it ‘as performance’ can feel like staring into a bright white light – one knows something is there, but its exact shape and contour become invisible in the glare. What we need is a way to disaggregate, and thereby specify, the amalgamated field of ‘performance’, to refract this condensed white light – as through a prism – so that we might be able to disperse it and appreciate its component parts. That is, rather than evaluating artworks by positing them as performances (or performance-related or -based), we need a way to interrogate how a work organises and articulates themes that have been central to the development of performance discourse and its diffusion. The conceptual prism could not be something singular like the ‘lens of performance’ because performance is itself the object to be understood. The prism I am suggesting would comprise a matrix of four key relationships, each of which stems directly from how works of performance have been situated and historically understood: that between ephemerality and the archive, between action and idea, between collaboration and estrangement, and between reality and representation. It is these four relationships – what I will call the dimensions of performance – that any work looks to articulate or somehow recalibrate. The proposed set of conceptual tools – four axes, each comprised of two, dialectically paired concepts – renders visible the different avenues by which artists have pushed the boundaries of production and, simultaneously, can specify what we mean when we say ‘performance’. Each of these four dimensions describes a tension between seemingly opposed, yet intrinsically related concerns. By pursuing how a given work negotiates each of these tensions allows us more clearly to see how a given work’s formal organization understands the nature and purpose of art, positions its audiences and articulates its social, political and spatial situation. The objective is to imagine how we might be able to describe and even measure the dematerialised, ‘performative’ dimensions of art. Questions about the temporality of performance have motivated some of its most important theoretical discussions and historical analyses – to the point where ephemerality has largely been understood as intrinsic to performance’s medium identity, that it consists in its inevitable evanescence. Yet the question as to whether performance resides in its live moment or in its documents remains far from settled, especially given that many works we now describe as performance never have a live moment and/or are being collected, in some form or other, by museums. By considering a work’s ephemerality and its relation to the archive as co-determining, we can describe more precisely what is at stake in how a given piece is materially constituted. That is, in recognising that a work’s ephemerality is not only positioned against its ability to be archived, but is, in fact, secured by what type of documents survive (and are, thereby, archived), what comes into focus – perhaps counter-intuitively – are its material components, in what forms it resides and on which it depends. 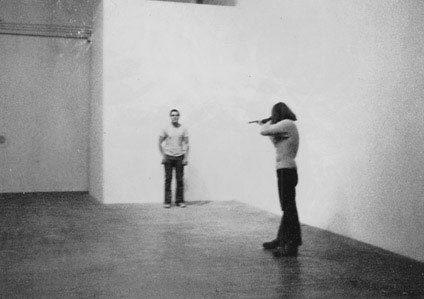 For example, Chris Burden’s Shoot 1970 (fig.5) lasted only as long as the flight of a bullet but the photographs of the piece have not only allowed the work to persist through time but have also heightened the perception of its fleeting instantaneity, showing us, in effect, what we missed by not being there. The result is the perception that the work consisted in his physical experience of pain, the unique qualities of his body and his willingness to endure what the audience can continually imagine, but could never fully experience in the first place. On the other hand, Nan Goldin’s ongoing work, The Ballad of Sexual Dependency (initiated 1985) uses the apparatus of a constantly growing and changing archive to commemorate and testify to a community’s self-construction. The work began as a slideshow performed for the same people pictured in its images, Goldin’s elective family. The centrality of the slideshow format, its iterability and its mode of display, point away from the supposedly immediate experience portrayed in the photographs. These materials instead signal the work accomplished by the order imposed on the images by the artist, as well as the communal nature of their consumption in assembling the assorted individuals and the fleeting events of their lives into a collective body with a shared history. Does the meaning of a work reside in what happened, the actions and processes that transpired in its creation? Or is the work driven by the artist’s investment in a conceptual schema or experiment? What notion of authorship is operational? The attempt to discern the object in performance requires that we see a work as a relationship between action and idea; in so doing we can better describe not what it is literally made of (as above), but what type of gesture carries its aesthetic import, the nature and quality of the processes involved in creating the work. A work can be action-driven, though this then enacts a specific idea of what art can be – a conclusion Rosenberg drew from Pollock’s painting. For Rosenberg, the skeins of paint traced across Pollock’s canvases were an existential combat, the pattern attesting to the drama of energies and decisions that went into its fabrication. Any appraisal of his work that focused on material (or medium-specificity) alone missed out on an essential dimension of the experience it could deliver when properly called to mind. This appreciation of action, for Rosenberg, meant that a new conception of art had come into being – one that included processes beyond the work’s physical borders. Or, on the other hand, a work can be principally idea-driven, potentially leading to a set of actions. Vito Acconci’s works, for example, can be seen as conceptually-led programmes for experiments in behaviour. In works like Seedbed, the proposition is primary; the results secondary. Both the quality of the experiments’ execution and how people reacted to them are irrelevant compared to the fact that the activities were conducted under the aegis of art and in conversation with its conventions. How a work imagines the creative process, then, bears directly on how it positions its viewers. Does it depend on our perceptual processes in order to function, or does it function to disrupt our perceptual processes? In the dialectical pairing of collaboration and estrangement, the answer to this question is usually far from clear-cut. 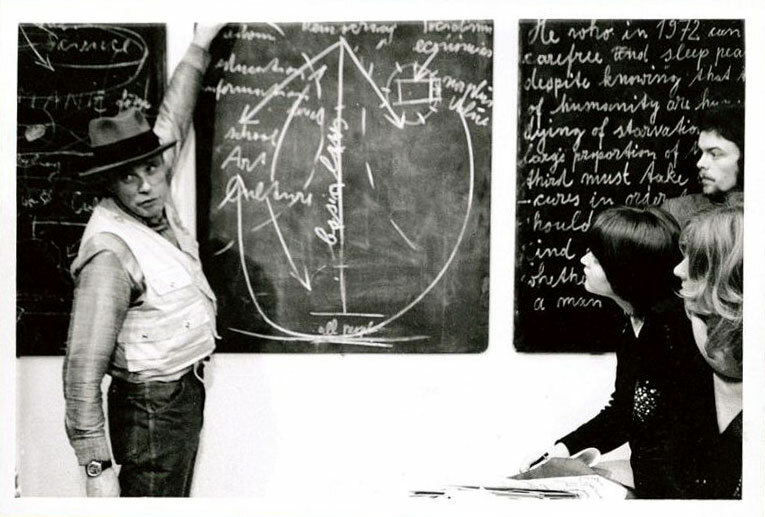 Joseph Beuys’s actions on behalf of what he termed ‘direct democracy’ consisted largely of real-time, in-person discussions of creativity and freedom. But the siting of one of these discussions at Tate in 1972 (fig.6), as an artwork he called Information Action, served to distance the participants and bring about an awareness of their own contributions to the day’s events. This self-estrangement gave rise to unexpected criticisms of Beuys’s approach to his stated goals – that he was not fostering radical collaboration, but assuming a dictatorial role as first among equals. 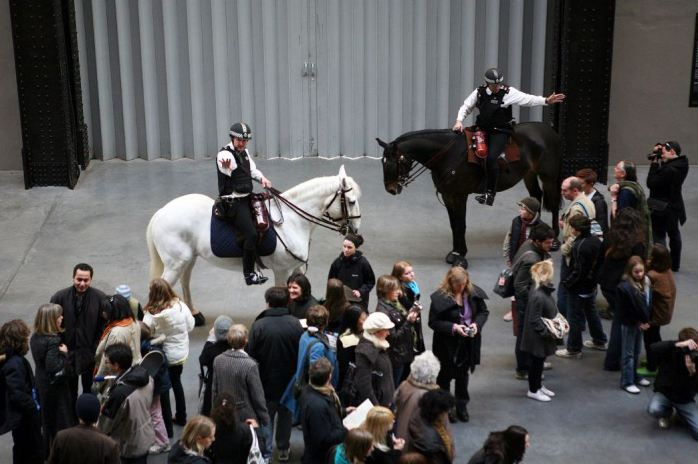 On the other hand, Tania Bruguera’s Tatlin’s Whisper #5 2008 (fig.7) was designed to discomfit museumgoers, to estrange people from their surroundings and themselves, by having mounted police conduct crowd control exercises in Tate Modern’s Turbine Hall. But the work depends on people’s compliance with orders given; in order for the work to function, people must collaborate in their own subjection. Seeing collaboration and estrangement as always in relation to each other allows us to perceive with precision what a viewer is meant to give to and get from an artwork, and what realities these designs produce. It is often said that performance is real because it is immediate. By understanding the relationship of reality and representation as it exists in an artwork as a dialectic, however, it becomes clear that what is often perceived or pronounced to be immediacy is a carefully wrought relationship between lived experience and various media. If the work somehow engages reality, this ultimately depends on how it deploys techniques of representation and how it works against conventions in a given context. In other words, reality is understood or imagined as that which exceeds representation; the definition of each depends on how one imagines the other. Attempts to locate the edge of representation and its crossing over into immediate reality describe the political-aesthetic horizon of a given place and time – what people expect from art and how they reflexively understand the nature of their everyday reality. Kaprow’s happenings, for example, heightened one’s sense of reality by including selected emblems of it within the framed space of artistic experimentation – newspapers, disused car tires, other people and so on. Underpinning this notion of blurring the boundary between art and life was the belief that ordinary life was unexamined, somehow inauthentic, and that an expanded art could revivify experience and reconnect individuals with their true selves. On the other hand, Cindy Sherman’s self-portraits (fig.8) chart a course to reality through the terrain of the simulacral – in the form of fictive personae who are copies of copies, banal in their unreality. Although Sherman both arranges and sits for each of her photographs, they are not self-portraits but her manipulations of representational conventions. It was this activation (and re-circulation) of representational convention to which Crimp ascribed the power of performance. When Sherman poses as ingénue or homemaker or tomboy or office worker, she puts stereotypes on display. At the same time, when we recognise the character in the photograph as portraying some ‘type’ of woman, what we see is not a fake person, but the way in which our own grasp of social reality proceeds from these conceptual categories, which themselves derive from the representations we constantly consume. While these two artists might form antipodes of this dimension’s spectrum, both have been crucial to the formation of performance discourse. In each case, seeing reality and representation not as opposites but as co-determining concepts helps us to articulate the work’s social and political stakes. Pursuing how a work sites the boundary between representation and reality allows us to locate it in a wider political-aesthetic milieu. As such, this dimension not only offers the flexibility required for appreciating differences in performance works across time but across space as well. Local conventions of representation will always entail equally specific local notions of reality – and vice versa. Finally, a given work does not exist on or negotiate a single axis but all of them simultaneously. Bringing each of these dimensions to bear on the analysis of specific artworks will allow us not only to specify what we mean when we say ‘performance’ but also to restore to performance works the specificity with which they engage this complex of questions concerning the natures of art, life and their interrelation. By thinking about performance works in terms of the material ways they organise and address the experience of time, notions of process, modes of participation, and the nature of reality – that is, by moving beyond ontological obsession to historical reflection – we can also begin to reassess traditional disciplinary biases as scholars and curators. At the very least, this set of conceptual tools renders visible the different avenues by which artists have pushed the boundaries of art on its most contested fronts. It is my hope that the proposed framework might make available a more flexible and responsive method for approaching art as a relationship between a work and its audiences above all else. Performance – insofar as it exists at all – is designed to announce and explore that fundamental condition of contemporary art. 1. Use of the word ‘performative’ merits consideration in its own right. Suffice it to say here that the adjectival usage at issue in this essay (meant to describe artworks that are ‘performance-based’, ‘performance-related’ or even ‘performance-like’) differs substantially from the term’s original development in the work of philosopher J.L. Austin and that more precise theoretical formulation underpins the notion of performativity explored by such thinkers as Jacques Derrida and Judith Butler. For a useful comparison of these distinct homographs, see Dorothea Von Hantelmann, How To Do Things with Art: The Meaning of Art’s Performativity, Zurich 2010. 2. Harold Rosenberg, ‘The American Action Painters’, in The Tradition of the New, New York 1960, p.33 (originally published in Art News, vol.51, no.8, December 1952). 5. Allan Kaprow,‘The Legacy of Jackson Pollock’, 1958, in Allan Kaprow and Jeff Kelley, Essays on the Blurring of Art and Life, Berkeley, CA, 2003, p.5. 8. 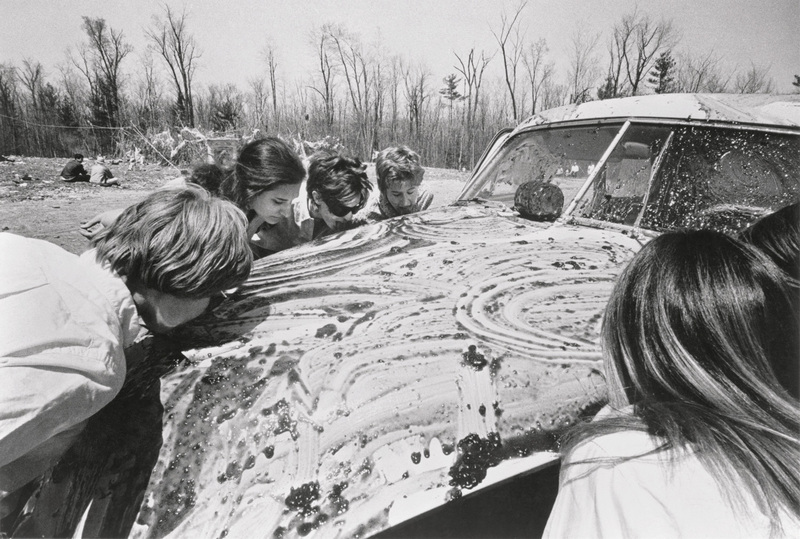 Allan Kaprow, ‘Happenings in the New York Scene’, 1961, in Kaprow and Kelley 2003, pp.16–18. 9. Douglas Crimp, ‘Pictures’, October, vol.8, Spring 1979, p.77. 11. ‘Paradiso: Performing the Renaissance Conference’, Performa, http://performa-arts.org/news/item/paradiso-performing-the-renaissance, accessed 20 June 2015. 13. ‘MA/MRes Performance and Creative Research’, course brochure issued by Department of Drama, Theatre and Performance Studies, Roehampton University, London 2014, p.1. Jonah Westerman, 'The Dimensions of Performance', Performance at Tate: Into the Space of Art, Tate Research Publication, 2016, https://www.tate.org.uk/research/publications/performance-at-tate/dimensions-of-performance, accessed 20 April 2019.